1 1/2 pound Fresh Live Maine Lobsters! Home > 12 Packs Of Lobsters! > Land O' Lakes Butter > Fresh Lobsters! > All Size & Individual Lobsters On Sale! > 1 1/2 pound Fresh Live Maine Lobsters! All Size Lobsters Are On Sale Now! Our 1 1/2 Pound Live Maine Lobsters are the perfect size for get-togethers and will make you the hit of the Party! Shipped Fresh Overnight To Your Door! Fresh Lobsters! • Live Lobster 2 Packs! • • Live Lobster 6 Packs! • 12 Packs Of Lobsters! The Perfect size for get-togethers and will make you the hit of the Party! Shipped Fresh Overnight To Your Door! Note: Price is per Lobster. (Minimum of Two)Please enter quantity upon checkout! 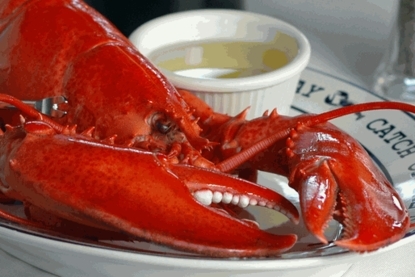 Order Maine Lobsters By 10am EST, And Enjoy Them For Dinner Tomorrow! Lobsters Also Make A Great Gift Idea For Your Favorite Seafood Lover! How Easy Is That! Placed my first order last week and everything was wonderful from placing the order on the phone to receiving the shipment to enjoying the clams and lobsters. Will definitely order again and recommend to everyone. Thanks. hand down the best maine lobster ,best prices best everything! I ordered six halfers, and they showed up , on time in a great box, and turned into a great dinner! you need more claws for your rating thing, how about a 10!